Evidence of fire at Longgushan. 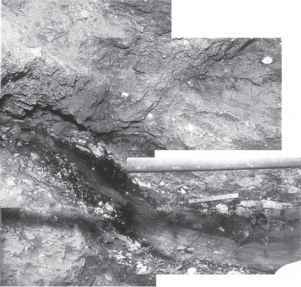 Top: A close-up view of the sediments of Layer 10 from the western wall of Locality 1 showing the association of burned bones with stone tools. Bottom: Burned mammal bone (probably a fragment of deer rib) derived from Layer 10. It is unclear how this bone relates to hominid activity, but other bony remains from the site suggest intentional roasting of meat by Homo erectus. cannibalism were discovered, or at least reported, in the ensuing four centuries, but rarely were they reported by reliable chroniclers. The reports were so embellished in some cases that they were difficult to believe. Later ethnohistorians questioned many of the accounts, including whether Caribs really did engage in the practice to which they lent their name. Nevertheless, the image of dark-skinned natives with nasal septa pierced by bones, gathered around a human-sized cooking pot brandishing upraised spears became indelibly stamped on the popular mind. Much less widely known but equally important to our story were archaeological discoveries throughout the first half of the twentieth century that showed clear evidence of past cannibalism in Europe. That these evidences were first found in Europe was more a function of there being a greater density of archaeologists there than anywhere else. But they served to confirm that cannibalism was a worldwide human phenomenon. It was in Europe that Franz Weidenreich first encountered the archaeological evidence of cannibalism. Neandertal bones found at the sites of Ehringsdorf in Germany, Krapina in Croatia, and Monte Circeo in Italy all showed signs of butchery that archaeologists have interpreted as cannibalism. Chief among their proofs was the breakage of bone around the foramen magnum, the aperture at the base of the skull through which the spinal cord passes to the brain. Early people had apparently been "headhunters"— beheading their victims and eating their brains. Ethnography helped out with this scenario by furnishing reliable accounts of contemporary cannibalism and the eating of human brains by tribalists in New Guinea. The practice was discovered in the 1920s to be associated with the neurological disease "kuru," and was banned by the colonial governments in the region. French archaeologist Henri Brueil argued that the relative absence of limb bones at Longgushan meant that Peking Man had been a head hunter.12 We now believe that this pattern resulted from hyenas' chewing and destroying hominid limb bones. Weidenreich, as an anatomist, was also acutely aware of the parts of the Homo erectus skeleton that were missing. After all, their absence did not allow him to completely describe the anatomy of the species, his avowed goal. Weidenreich at first accepted, and then rejected, Breuil's cannibal argument based on limb bones. He felt on firmer ground with the skull remains. Most of the faces of the skulls were missing, but all of the skull bases surrounding the foramina magna were gone. Instead there were large, unevenly cracked holes at the base of the skulls. 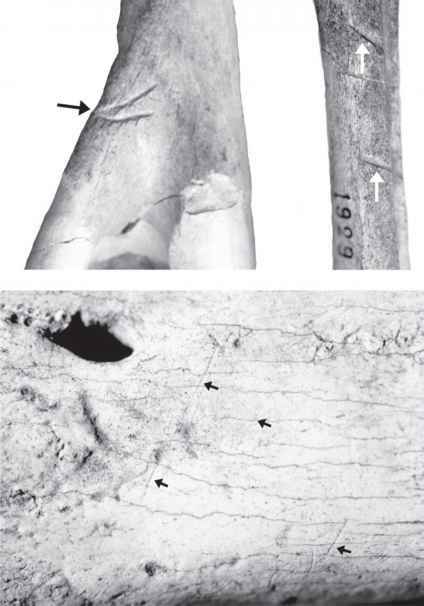 Weidenreich drew on his knowledge of the European Neandertal record to interpret this consistent pattern of damage as evidence of cannibalism. Many Homo erectus bones bear the marks of carnivores' chewing on them and were probably the remains of hyenas' meals. 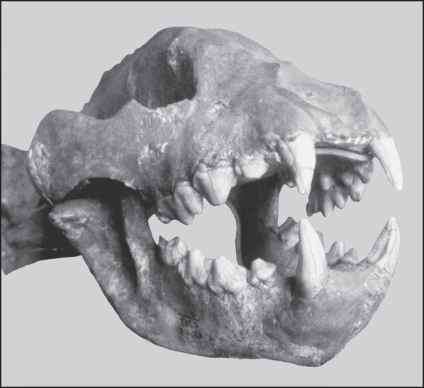 Longgushan was home to the giant cave hyena, Pachy-crocuta brevirostris, a species the size of a modern African lion. During the Pleistocene it lived throughout Eurasia and denned in caves. The species is believed to have actively hunted and scavenged large-bodied species of herbivores. This nicely preserved skull is part of a virtually complete skeleton of Pachycrocuta excavated from Longgushan and is on display at the Peking Man Museum, Zhoukoudian, China. breaking the skull to get at the brain—but by giant hyenas, not the homi-nids themselves.13 There are hyena bite marks on the tops of the fossil skulls—evidence of the hyenas' massive jaws—and there are no marks left by stone tools around the skull bases. of stone tool cut marks before, and we were surprised at what we found. At low magnification (10x) the surface of the bone is quite well and faithfully rendered by the plaster cast. A number of parallel-oriented, characteristic stone tool cut marks can be seen. 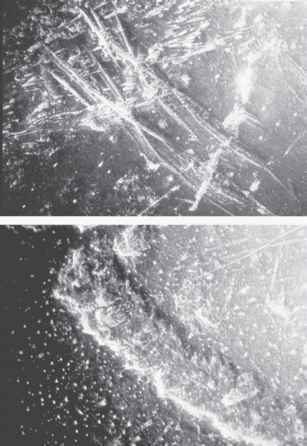 The pattern of damage is the same as that produced experimentally by sawing a flake tool back and forth to deflesh bone. We thus agree with Weidenreich that these are stone tool cut marks on Skull V. These cut marks are located on the left skull wall underlying the area of bone to which the temporalis muscle is attached. In the anatomy lab we have used a scalpel many times in this same area to dissect and display this muscle—the largest jaw muscle and the one we use to close our mouths and grind our teeth. 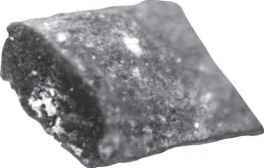 We may presume that Homo erectus, however, used stone flake tools to remove the temporalis muscle of a dead compatriot, not to study its anatomy or deflesh the body for burial (which we have no evidence for in Homo erectus), but to eat it. In China we examined the surface of the original fossil bone of Skull V, recovered in 1966 and forming part of the same specimen found in the 1936 excavations. We reasoned that if the cast of the temporal bone showed cut marks, then there would be a good chance that the original fossil would show them as well, and in a more reliably preserved context. We discovered evidence of stone tool cut marks on the frontal bone of Skull V, confirming Weidenreich's original observations for this specimen. We believe that Skull V shows that Homo erectus cut muscle off the head, and thus very likely engaged in cannibalism at Longgushan. Hyena-induced damage on a Homo erectus skull. 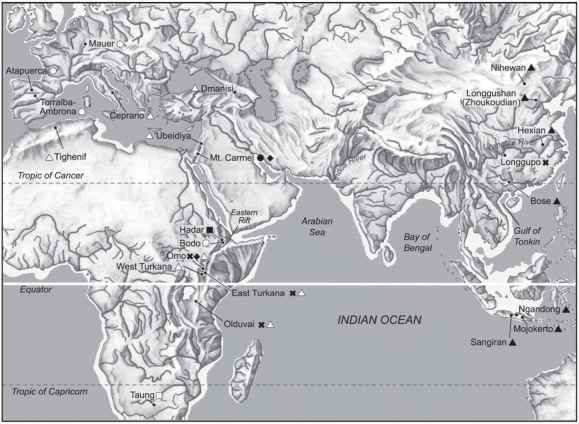 Top (A) and Middle (B): White ovals depict the location of a probable hyaenid bite mark on the right browridge of Longgushan Homo erectus Skull V. This specimen was discovered in 1966 by Chinese excavators. Incredibly, it was found to fit exactly the plaster cast of the back parts of Skull V, which had been discovered in 1934 and 1936 (and then lost during World War II). The frontal bone of Skull V (PA 109) is the only remaining original fossil skull of Peking Man, and thus is useful for detailed study of its surface damage. Bottom (C): SEM photograph of an impression of the right browridge of Skull V. The bite mark area shows a shallow groove with a U-shaped cross section characteristic of a large carnivore bite (paired arrows define the groove). Distinguishing bite marks from carnivores from stone-tool cut marks. Top: scanning electron microscope (SEM) photograph of prehistoric cut marks made by a stone tool on mammal bone from the site of Nihewan in northern China. Stone tools leave bone-thin, semi-parallel marks with V-shaped cross sections. Bottom: Bite mark made by a carnivore tooth on another mammal bone from the site of Nihewan. Carnivore bite marks are wider and with U-shaped cross sections. Magnification is about 14x. in dire circumstances. There is no symbolism here, just the satiation of extreme hunger. Which, if either, of these possible explanations for Homo erectuss cannibalism is more likely correct? The signature of Homo erectus. Top: Bite marks made by carnivores on an upper foreleg bone (humerus) of an ungulate (left) and on a foot bone (metapodial) of another ungulate (right) from Locality 1 at Dragon Bone Hill. Bottom: Stone-tool cut marks made by Homo erectus on a mammal bone from Locality 1 provide clear evidence that hominids were in the cave at Dragon Bone Hill. Stone-tool marks tend to overlie carnivore bite marks when the two occur together, implying that the large carnivores killed the prey and that Homo erectus scavenged it.